Implementing Petrus giving a quest at random is something we can have to continue adding dungeons without adding game length, and the random factor also adds to game replayability. Personally though, I would also include ways to trigger flags that would guarantee that you receive a certain quest, so that people wanting to challenge specific dungeons can do that without starting a new game and going through UT every time. I agree 100%. It would be good to have a generalized framework to unlock new destinations using script files, but at the moment it is something that still needs coding. I will at some point add some options in the configuration menu to tweak the world generation algorithm to select continents in a range of larger sized continents. At the moment the Attnam continent can be between 25 and 1000 tiles big. A 25 tile continent is silly nowadays, because it is very likely to be too small for the sampler to pick up positions on the continent to put user-defined dungeons. And so currently the user-defined dungeons (like the one we are designing in this thread) will simply appear on another continent, for which you will need the spoily martial arts prize to reach, or some spoily funghi. If we have lots of dungeons (in an unlikely and dystopic future) then we may need to resort to a pangea. Now that I think about it, if there's a dungeon you REALLY want to play and haven't done so yet, then I guess you could turn off all the other dungeons and so the last remaining dungeon would therefore guaranteed the nearest spot to Attnam town. But I digress a little. Yep, some framework for unlocking new places, and for that matter, changing the story state, would need to be implemented at some point. BTW, will the maze floor generator be included in the next release? Basically, the player has to fight through a series of rooms, each with a stonger mosnter than the room before. All the doors are locked with an octagonal lock, making it more or less the player's choice when he will tackle each. Thinking about the several forms of Xinroch the player will meet, what if we base it a bit on Egyptian concept of body and soul? Basically, everyone has several parts or types of souls and the player could battle all pieces of dead Xinroch. The current Xinroch, is he didn't appear elsewhere yet. Melee fighter type. His sheut, could be quite weak, but with huge Dex and Agi, making him quick and capable of criticals. Can also walk through walls. His ba, probably should be spellcaster for a change. Can walk through walls. His ka and the final boss. Warrior-wizard, because casters in IVAN are powerful and combining magic and melee prowess could be lethal and !!Fun!!. Can walk through walls and might even teleport. I was also thinking about an artifact cloak "Shadow Veil" found in this dungeon (and non-wishable). It would grant no AV, but ethereal status (as ghosts have), letting the player walk through walls. So, I had an idea. Normally Xinroch uses a sword and shield; red_kangaroo suggested having him dual wield as in the story. Except since the story is based on the game I had one of them become lost. I also made a suggestion that for additional length we could have another dungeon. Well, what if the additional dungeon was in pursuit of Xinroch's final form, and the final form has the other flaming sword? We can make it an artifact to reward players for beating Xinroch once and for all. Sounds like the tactical level I have planned for the dungeon, probably along the lines of what you suggested. I don't have a design strategy for this, so I will appreciate any input for this. This is a really boss idea. Will take a bit of thinking to make it function properly. I like the idea of fighting different forms of the same boss, a bit like Doukutsu Monogatari. This last one is crazy good. I'd never thought of this at all... Will have to run some experiments. I like this too. The road to the additional dungeon could be reached by taking a portal which you could, for example, reach only by Ethereal status (meaning you would need to have the Shadow Veil, or be a ghost). At the moment, my thinking has been to have two forms of boss, normal skeleton Xinroch, and a resurrected Grand Master Dark Knight Xinroch. But this is subject to change, as always. I also have the "Skull of Xinroch" in mind as a kind of artifact. I don't know what it will do. I like the Shadow Veil and the lost flaming sword, and I'd like to incorporate those somehow. Avatar of Chaos (score x3) and High Priest (score x5) victories are still the highest victory tiers. Which is okay. How to substitute Freedom and Knighthood victories? Could there be a Freedom victory and a Dark Knighthood victory offered by the Tomb of Xinroch? I'm planning for a necromancer in the jail cells in the Attnamese catacombs to tip the player off about the tomb location, in exchange for the scroll. But I still want Petrus to give out a freedom victory for assailing the Tomb of Xinroch... How to do this mechanic? The reason is because I want the player to have a shot at considering his options to do good or evil in the world. (score x3) Dark Knighthood: Beat all the Xinroch incarnations and deliver a Xinroch artefact (Lost Sword?) to the Necro dude in the cellars (??) or take over the mausoleum entrance on Level 1 (??) - honestly I have no clue how to do the narrative part to make this fit together properly. (score x4) Enhanced Avatar of Chaos - this is Dark Knighthood tier with all the Xinroch artefacts (Skull, Veil and Lost flaming Sword), plus conventional Avatar of Chaos victory, involving the nut. My plan: Release what I've got in September, and then test things out and get feedback, ready for a final form at Christmas. This last one is crazy good. It must be an endgame artifact, because it will be overpowered no matter what. I think freedom can be granted for the Skull of Xinroch, it has nice analogy with the current freedom ending - head of a monster endangering Attnam for your freedom. For knighthood ending, I'll take the liberty of quoting myself. Knighthood-tier could use the avatar of Valpurus laying on the other throne in the Cathedral. You would need to steal it (angering Attnam) and offer it at a High Altar of Mortifer deep within Tome of Xinroch, to receive a blessing of Mortifer, which would result in "corrupted avatar of Vapurus" and you would win by using it upon the altar in the Cathedral converting the High Altar of Valpurus to Mortifer, who would promptly rain death and sorrow upon all surviving Attnamese? Normal knighthood is harder than freedom, but doesn't make you fight Petrus and the whole Attnam. This ending would make the whole Attnam angry, but if you are quick and clever, you still don't need to fight them and Mortifer will kill off everyone once you negate the protection of Valpurus over Attnam. That would make it easier than Chaos and High Priest endings (no need to kill Petrus), but harder than freedom (you are cut off Attnam and all its shops and repairs, plus need to return). The answer to me seems simple. So long as you hold the Skull of Xinroch, dark knights and evil spellcasters will obey you without question. This gives you easy passage back, or the option to head that army and return to Attnam and rescue the imprisoned necromancer. Victory can be declared upon entering the catacombs, or if that's too easy, upon freeing the necromancer then exiting Attnam. Also, I don't see how Shadow Veil will be too OP. Even if you're hiding in the walls, you're still subject to spells, and it won't protect you from being attacked if you're next to an enemy. Seems to me that 0 AV will balance out the ethereal nicely. At 0 AV and no SoCM allowed, the veil would be strictly a situational item for saving on some teleport charges. Which would be totally fine! The player can always carry a conventional cloak for combat purposes and only swap out for breaking into secret rooms, avoiding hostiles or just walking through everything to the next set of stairs. It would however mean the dungeon layout has to be designed around the player possibly having it. Ethereal status could trivialize a lot of content if you can simply walk past every obstacle. The status is not limited by charges the same way controlled teleports are, which are already somewhat problematic from a level design perspective. That was what I meant. Ethereal and telecontrol are two most powerful status effects the palyer can get, because they both allow for much greater mobility than normal and aid in avoiding many if not msot obstacles the game can throw on you. An easy and cheesy way of taking the edge off ethereal would be to spawn more creatures that can walk through walls, just as invisibility increases spawns of creatures who can see invisible. Incidentally this also fits the theme quite well, so long as they get at least a short range ESP to see the player through walls. Not a perfect solution to be sure, but it'd at least make skipping things slightly more hazardous. It would also show off the new ghosts really nicely. Quick question, does ethereal include levitation by default, or alternatively the ability to avoid traps and not drown in water? I kinda like the idea of being essentially a physics prone ghost. The idea of being able to pass through water tiles but subsequently drowning because you still sink under the water and can't breathe also amuses me. And it'd be a very IVAN thing to happen. Just a thought but maybe have that cloak only available in a certain dungeon where there are more monsters (or just a ton of ghosts)? I tried this by editing the script files to remove the levitation flag from an ethereal monster, then polymorphing into that monster. I could walk through water tiles on the world map with no problem, but I was able trigger and be caught in bear traps. Iiinteresting... This brings us to the question how do we explain the character breathing while he is immersed in brick, dirt or stone if he'll still drown in water? Put a time limit on how long you can go without breathing and you've come a long way towards solving the problem. While true, it seems unnecessary to put in an entire mechanic that only gets used in one or two circumstances. Personally, I think we should simply deal 1HP head damage accompanied by a message saying you're running out of air or something. That can be a quick fix until we work out whether or not this "breathing" mechanic is something we want, along with where and how it's going to be used. Thanks for posting all the suggestions, I've tried to take into account as many of the ideas from here as possible. It's certainly not polished, and I feel it resembles GC a bit too much in some places. But that is what testing is for! Next three months. Then fine-tuning ready for December 2016 release. Sorry for the double post. We can use this thread to gather suggested improvements to this dungeon if you like. First win done. No artificial limbs / pets as usual. The only cloning wand (2-charge) during the entire run came from a lamp wish after UT3, not a single other mirroring or cloning source. 3 scrolls of charging total, two of which were in the library. Mellis was quite generous with ommel substances, with some cloning I rounded up around 15 cerumen, 8 snot, 8 urine, 5 tears and 1 sweat. Equipment didn't really change after the change to octiron in TX10, found a max of around 4 of EA/EW each deeper in. The difficulty curve felt off. Levels TX1 thru 6(?) were rather easy even in really poor equipment (stolen from a mistress torturing chief from Nefas). Compared to GC, I'd been torn to shreds on the wolf level. Aside from a few danger spikes (accidentally releasing a veteran dwarf from the oasis), there were no real actual hazards up until mages started appearing. Even then an amulet of elemental prot mostly countered them. Combined with the relative lack of instantly recognizable elements, being rather easy meant most of the levels felt like filler instead of interesting places to explore. GC10-GC11: You're now in hell level! GC12: Massive room with nasty things level! GC13: J/K, now you're actually in hell level! Whereas for TX, based on a single visit so far, uhh... There was the oasis, the shop, the experimental lab, the dwarven room that blew up right after entering the level, the enner kids, the level where you suddenly run into the ghost of Xinroch and the harder levels after that. I'm sure the levels would be easier to tell apart with more attempts. However, with just a single visit I honestly cannot tell them apart because most of the early levels (pre-TX10) were easy to just blitz through without too much thought. What TX really needs are hazardous elements of interest. Excluding GC8, the GC levels aren't defined by their non-threatening elements (chest room, dungeon shop, hidden chest), but by the threats you need to overcome or avoid on those levels. Those are what make the levels challenging, not the level generation or regular monster spawns. Including dungeon elements that aren't out to kill the player is fine, I just don't believe they should take the spotlight from what I see as the meat of the game. As it stands, there were hardly any difficulty spikes to spice up what felt like simply filler quite similar to GC1 or GC4. As for the post-TX10 levels, they were pretty alright for x2-x3 ending difficulty. Definitely harder than a freedom ending but not quite reaching the GC11-GC13 levels. The small mage room felt like something you can actually take on dependably, as opposed to the magical murderfest that is the GC mage room. Invisible elder dark mages were a lovely hassle to deal with. Xinroch himself could be buffed a bit, he felt less of a threat than even Elpuri. I'm assuming there was some possible victory involving raiding Attnam, but I couldn't find any in-game breadcrumbs hinting at that. What're the other victory triggers? * Overall look in pre-TX10 levels is indeed pretty close to GC. Some more differentiation would be nice, though I don't know what that could be at this point. * The level with a friendly necromancer gets really annoying when zombies start to pile up. 1-tile wide tunnels really don't fit having a mass of neutral NPCs milling about. Waiting behind a rolling zombie torso to get anywhere is not fun. How about just replace the master necromancer with a new caster type NPC that doesn't reanimate things? * The kitchen feels rather useless as it stands. With regular Mellis prayers, I was not in any danger of starving at any point. * Already mentioned elsewhere, but I do agree that the gas chamber explodes too easily from passing monsters. * Maze rooms should not IMO be generated with an altar. Being cut off from all other gods in a particularly twisty tunnel seems very arbitrary when combined with how long you tend to spend exploring them. * Maze terrain under walls should match rest of the level, having patches of different material on the ground after an earthquake looks odd. * In the latter levels, ebony floors with octiron walls makes some mazes too hard to read. I'd suggest choosing a bit lighter floor material for more contrast. * The tactical level (I think? the long red tunnel place) could possibly have some light sources littered about to let the player use the added sight range. * Is dark knight win a score x2 or x3 ending? I honestly can't tell. I'll be giving a go at the other wins at some point, but that just about covers my initial thoughts on the dungeon. I'm quite sure there were other things as well at some point, actually keeping notes might've been a nifty idea. OK, I've gotten a victory. Not quite sure whether events happened as intended. Start-scummed for INT and WIS. After exiting UT with some loot from a bones file and a Mjolak, I went for artificial limbs as soon as I could, severing all my limbs with meteoric steel bear traps and praying for replacements. Got two good limbs and two bad ones due to mistakes and bad luck, but it was enough to win at sumo wrestling. After a bit more exploration and sci-talking I was able to get phoenix feather limbs and gear. Mustard gas was plentiful enough to kill Petrus with a betrayed dwarf, with a veteran guard and a couple of bottles of acid helping to retrieve the Justifier peacefully. With this I got to XT10 and killed Xinroch's ghost. Here things got a bit weird. I found Xinroch (the original one) soon after killing the ghost, killed it, and took its ruby flaming sword. I went back to Attnam to see what the necromancer said about all this. He necromancer did not care at all about the "wrong" flaming ruby sword. Is the old Xinroch supposed to spawn while doing this quest? Anyway, I figured that I had to go through the portal to get the "right" flaming ruby sword. Having playing GC10-13 before I thought it would be wise to beef up first. I had found 4 mirroring charges and wished for a 3-charge cloning wand. Scrolls of charging were plentiful. I didn't get any ommel cerumen until sci-talk was almost finished, but with so many spare cloning charges and good INT/WIS hats it was enough to let me talk to the dolphins and upgrade my gear to GEF/Valpurium. My normal practice is to bring a horde of wolves to GC6, drink lots of ommel snot, get 2-4 GEF limbs, and kill Izzy in a controlled environment, so that I can be overpowered for the rest of the game without any worries. Absent any empty levels in XT, I brought the wolves to XT2 instead. Upgraded and waited, but the resurrected Xinroch spawned before Izzy, carrying the quest flaming ruby sword. Is the resurrected Xinroch supposed to be allowed to spawn outside the last post-portal level? Either way, I cleared out of the Izzy-zone and took the sword to the necromancer. He helpfully let me know what to do to get the dark knight victory. I obliged, but I've made a copy of the save file so I can go through the portal and maybe win "properly" if this wasn't the intended sequence of events. GC throws serious danger (wolves) and serious treasure (minefield) at you quickly. Most of TX felt like GC1 for both risk and reward. I still died a lot in TX, partly because of undead spawning ahead of the power curve. In general the handmade features of TX are memorable, but scarcely impact gameplay. I liked the oasis. The lab was cute but didn't impact gameplay beyond stopping me from praying to Silva. The shop was worth scamming 3000 gold from, but otherwise useless (I did eat all its food, but only because I was running around the dungeon while stressed). The gas chambers always blow up within a few turns, and if I'm lucky I can salvage 3-5 items from the wreckage. The enner kids worked well enough. It might make things more interesting if they're on the same level as the lab, and their screams break the locks on the other cages. The level with the neutral necromancer (I think it's always the lab level) was terrible. 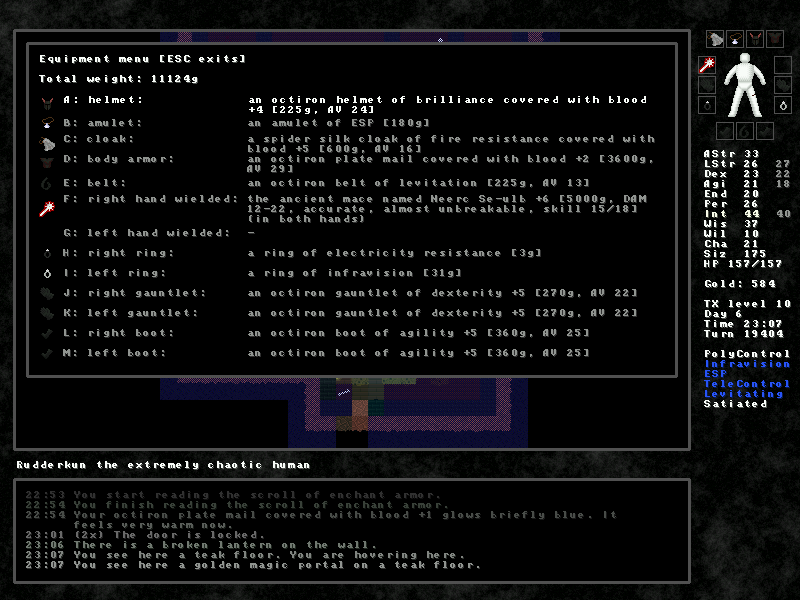 Undisplaceable monsters are OK in open areas, but in corridors they're tedious (and leprous). TX9 was good, the spellcasters hidden in doorless rooms were tough to kill. As the level layout becomes more familiar it might get easier to assassinate them quickly without teleport malfunctions. For TX2-10 I felt both risk and reward were decreased from GC. A lot of the reward of GC comes from the two big chests, the minefield, and the zombie level, which here are replaced by one chest and the gas chambers, which are less than half the size and mostly destroyed before the player can reach it. Apart from the enner and frog levels which it has in common with GC, most of the risks in TX are kept behind glass walls until the player or a freak accident lets them out - the oasis dwarves are behind water, the mutants are in locked cages, the necromancer and zombies are neutral. By comparison, the hazards in GC are unavoidable - the wolf room is almost always unlocked, the minefield needs to be explored as quickly as possible to avoid losing flammable items, the zombies and veteran dwarf on GC6 swarm you given half a chance. In GC, the succession of challenges facing the player makes for a lot of roadblocks - they need at least one of a selection of stats/abilities/items/equipment before they can attempt many of the levels safely. This often forces a choice between going in unprepared or using resources inefficiently (using wishes and charging scrolls, enchanting non-endgame equipment) to increase survivability in the short term. For most of XT, the only roadblocks are UT4 and the (deferred) enner level. Without that kind of pressure to consume (but also with a lot of luck), this character was able to save all their scrolls of charging for the final equipment/limb boost, despite the reduction in minefield/chest treasure. Bugfixes aside, future TX development should focus on active threats for the player to face. Weren't there plans for a spider boss? Maybe that would make a good stand-in for the wolf room. * TX level numbers seemed to jump from TX3 to TX5 in at least one of my games. Edit: Oh. Right. * The fountains full of glowing blood fill cans and bottles with 100g of fluid, rather than 500g or 1000g, and the message "You don't dare drink from this fountain" doesn't make much sense when I can drink the blood from containers without any harmful effect. * The necromancer's message when I show him the sword is weird. First he tells me to go and get it, then he says I shouldn't have it because I'm not Infuscor's champion? OK, I've loaded the backup and done the rest of the dungeon. Squashed Izzy and took a resurrected Sherry along for the ride. The resurrected Xinroch spawned again at the bottom of the portal level, and I ended up with two quest swords. Kind of wondering what would happen if I disarmed Xinroch, left him alive, and tried to claim the victory. Can't really comment on the difficulty of those levels, since I broke the power curve before going in. The minified mage room is nice, though. The dark knight victory was x4 believe it or not. I don't think this dungeon generates nearly as many monsters than a playthrough of GC though. The only other 'victory' is x2; see if you can discover it. - Pimp the necro-chamber to have a monster summoning portal. - Vampire bat room, with vampire and vampire bats, a la wolf room? I've taken all your (JoKe and Serin) other suggestions on board and will make those changes accordingly. I'm afraid I don't know what to do about the fountains right at this minute. They have lots of uses, so I don't want to do anything break them. Necrodude isn't really looking for the sword, but I agree the message is weird. His dialogue needs to be rewritten, he's basically speaking ad lib right now. Talk to the master guard in XT1 and he might give some hints. I initially wanted about ten underground levels, but ended up with more design elements than I planned for, so added another level. 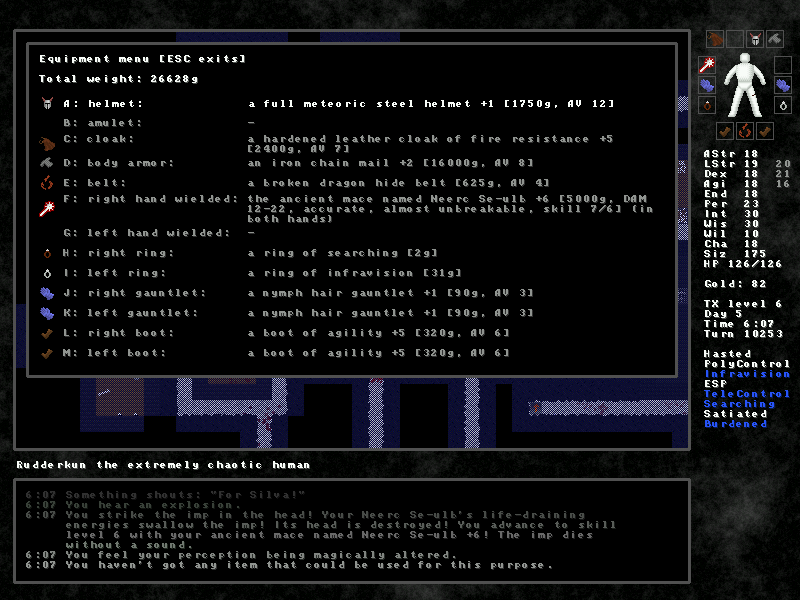 I'm thinking I will shorten the dungeon by one level, as originally intended. I have to say the TX entrance is bombastic! My heart probably skipped a beat when I saw a veteran dark knight right next to the entrance. And the interior with the pentagram... Awsome. Anyway, I like the vampire room idea. Do you mean to port vampirism from CLIVAN? Additionally, if he could breathe fire (or anything), he might only be able to do so from his head tile, thus making players standing on the other side of his body safe. Fire resistance is already something players seek almost as a prerequisite for GC/XT - maybe the dragon could breathe acid or poison or something? Having a dragon in TX sounds odd to me. How would it have ended up in a tomb and why? I'd save it for chao's tower, if he decides to take the idea somewhere that is. I like the idea of it being a neutral, optional boss monster. For any of the reasons above you could enforce the neutrality by making it be asleep when you find it but it wakes up (and becomes hostile) upon being attacked or if you try to take some treasure. If we wanted to be unoriginal we could also have it be a Dark Souls reference with it actually being an artificial dragon created by Xinroch. I sat down at a desk and drew the layout on some graph paper first, to get the geometry just right. Pen and paper always works a treat. Yep, I guess the time for this would be right. Vampirism is basically a state where a character's bite attack yields a life-drain bonus.